Born in 1990 in Berkeley, California, Amoeba Music is inspired by many of the great independent record stores. They stock everything -- from the most popular artists to the most obscure in all genres -- including jazz, international folk and popular music, roots music, classical music, all kinds of rock and soul music, just to name a few of the most obvious categories. Their staff is an all-star team of record store veterans who make music their lives in one way or another. Many are musicians themselves and their collective depth of knowledge is virtually unparalleled in the business. Amoeba Music started at a time when huge chain stores were mercilessly swallowing up smaller chains and independent stores, depriving many communities across the country of the opportunity to have a personal connection with their music retailers and a chance to find music other than what the major labels wanted them to see. 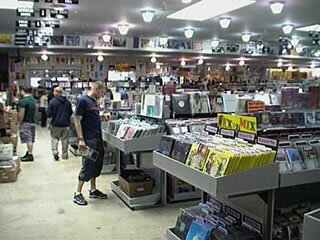 Rolling Stone Magazine suggests Amoeba Music could be the "World's Greatest Record Store." See what they have to say.